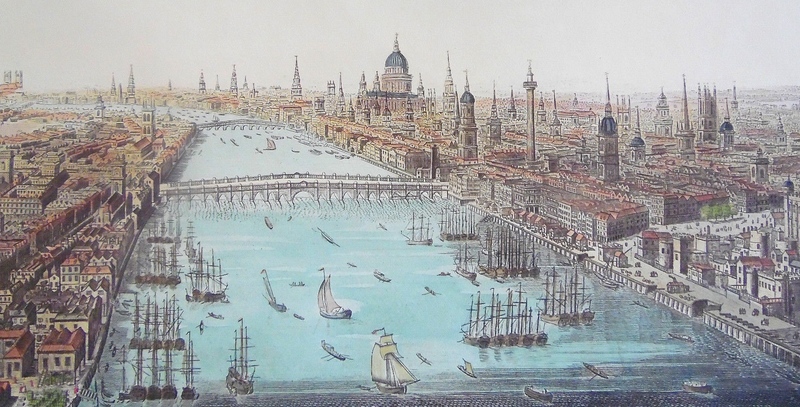 Looking west along the Thames in 1794. In the foreground is ‘Old London Bridge’, 1209-1831, the start point for the Doggett’s Coat and Badge. This shows the first 3,000 metres of the race, as far as Westminster. 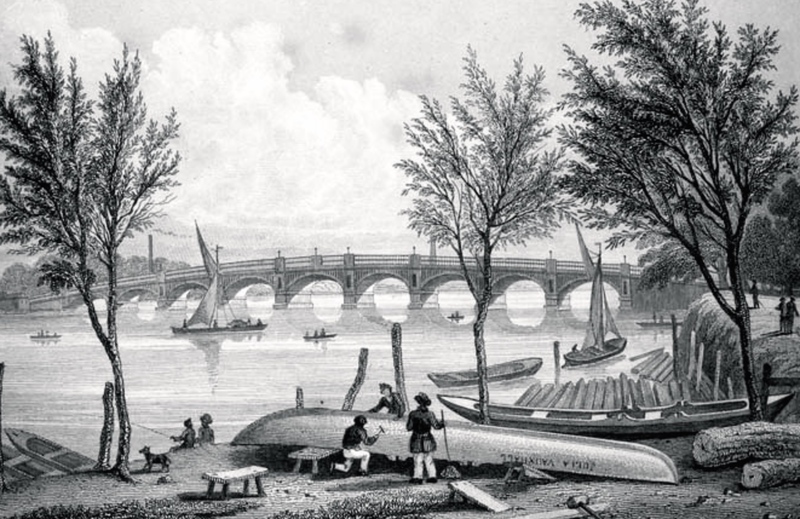 The other bridge is the first one built at Blackfriars, opened in 1769. 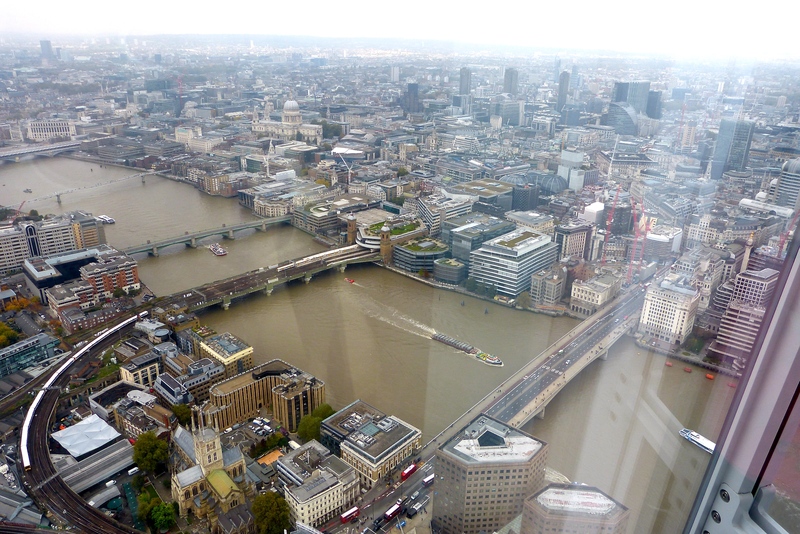 A shorter view, showing the first 1,000 metres of the Doggett’s course, pictured from the Shard building last year. On the right is the current London Bridge, opened in 1972. To its left on the opposite bank is Fishmongers’ Hall. The other bridges are Cannon Street, Southwark, Millennium and Blackfriars. This year, the media covering the Doggett’s Wager were given a surprise at the end of the race at Cadogan Pier in Chelsea. Disembarking from the press launch, one of those wonderful craft that are most commonly seen carrying umpires up and down the Henley course, we expected to get the usual ride back to the little victory ceremony at Fishmongers’ Hall on one of the big Thames Passenger Boats that followed the race. 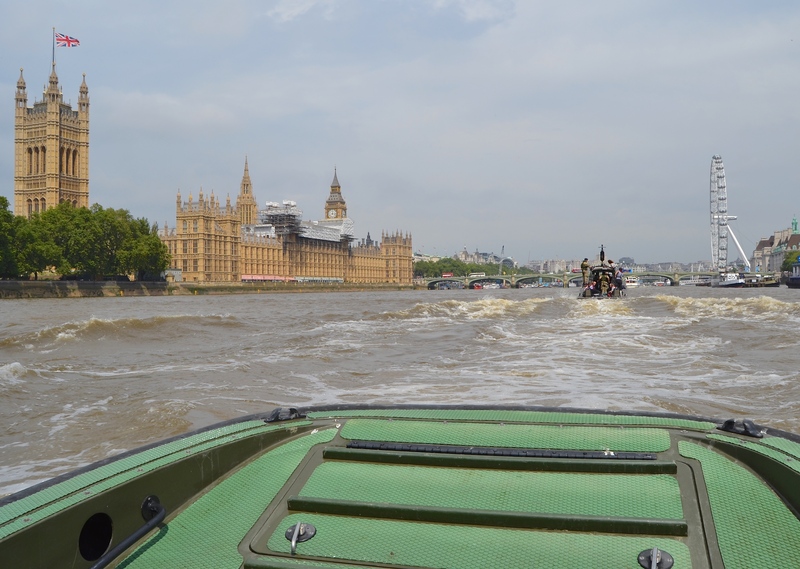 However, this year, we were directed to a couple of small military boats manned by Commandos of the Royal Engineers. Some went on what is called a ‘Combat Support Boat’ and others, including myself, volunteered for the more adventurous ‘Rigid Raider’. 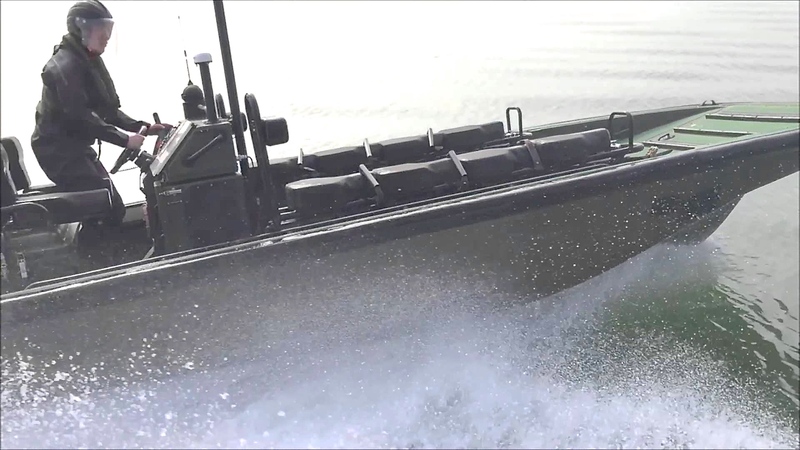 The Combat Support Boat is powered by water jet propulsion which allows high thrust at shallow draught. It is a versatile craft used for supply, engineering tasks and inland water patrols. A stock photo of a Rigid Raider, a 6.5-metre, 240hp landing craft and patrol boat, capable of 38 knots and which can carry eight soldiers and three crew. The ‘passengers’ straddle the saddle type seating and hold on very tightly. Clinging to the Rigid Raider on the journey back and, being exposed to the elements, not having the usual distraction of an onboard bar, and managing to suppress any ‘Apocalypse Now’ fantasies (‘Charlie don’t scull’), I was better able to appreciate some of the historic places with a rowing connection that we passed en route – starting with the site of Ranelagh Gardens in Chelsea. 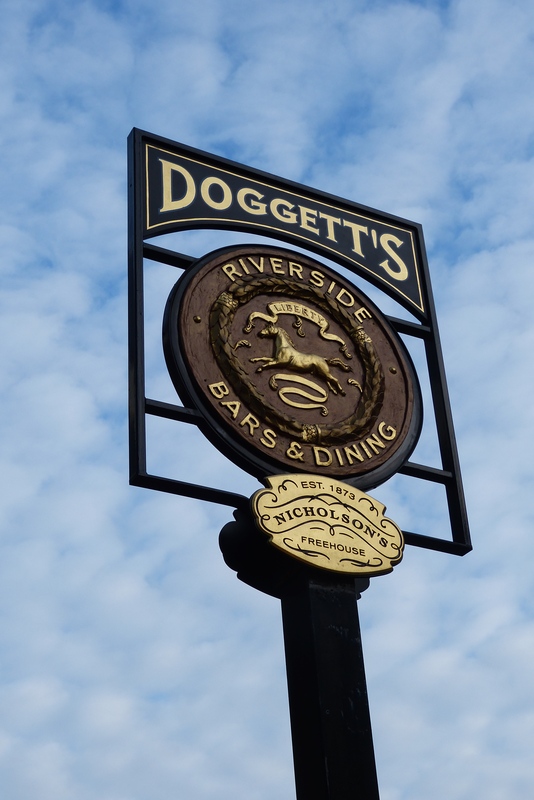 A picture taken during this year’s Doggett’s. The eventual winner, Ben Folkard, is about to go under Grosvenor Bridge (originally known as Victoria Railway Bridge). On the right, on the north bank, are the grounds of the old soldiers’ home, the Royal Hospital Chelsea. In the 18th century this was the site of Ranelagh Gardens. Ranelagh Gardens was a very fashionable and innovative pleasure park that was famous for its concerts, balls and theatrical events. In 1775, a number of the Gentlemen’s Clubs of St James’s decided to stage an event here that would combine all of these with an amusement that some members would have seen in Venice while on The Grand Tour, a regatta*. 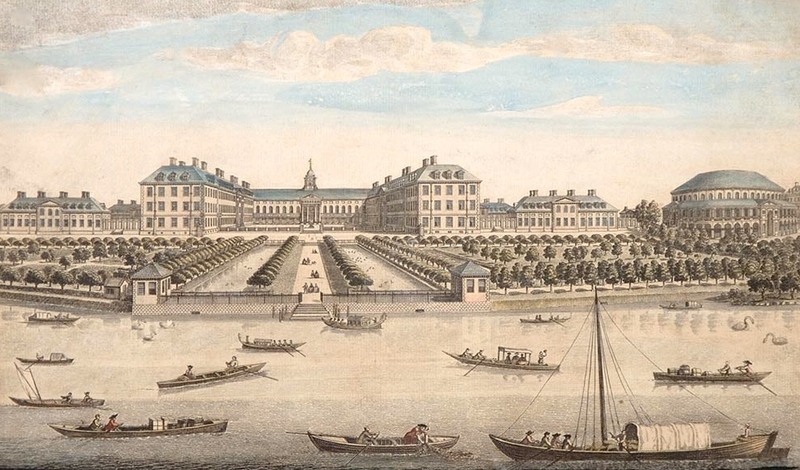 Ranelagh Gardens and the Royal Hospital, 1751. The regatta….. was in itself a noble spectacle. There were certain ingenious arrangements made to secure its success…. For example, the actual day was left dependant on the weather, and was announced by the flying of a red flag from Westminster Bridge, and by the continuous ringing of the bells of St. Margaret’s from ten till one…. An incredible number of private boats then assembled at Westminster Bridge, each with its rowers dressed in one of the national colours. The reds… on Middlesex, the blues… on Surrey, while the whites occupied the middle of the stream, leaving only the central arch free. Through this arch shot a number of watermen’s wherries on a race to London Bridge and back, for which prizes of some value were given. Upon the conclusion of this race, the whole flotilla moved up the river to Ranelagh at Chelsea. The Lord Mayor and the City (Livery) Companies were present in state. There was a prodigious saluting of cannon, fine music and an execrable supper…..
One of the 1,500 tickets sold for the Ranelagh Ball. In his Beauty and the Boats (2005), Tom Weil says that this is the earliest known image of a prize-giver for a sporting event holding up medals on ribbons. 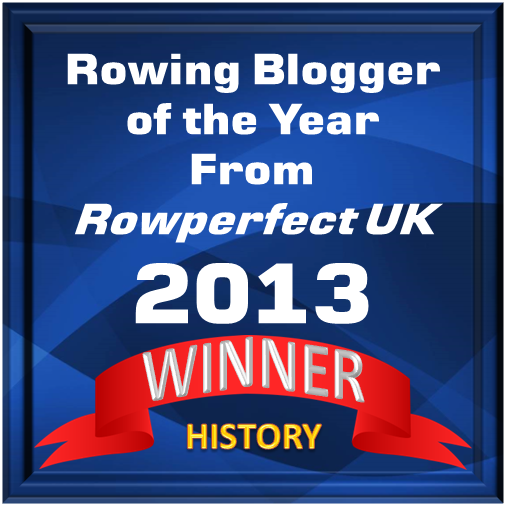 I should add that naked men are no longer allowed to officiate at junior rowing events. ….scaffold erections were to be seen on the banks….. Gambling tables lined the approaches to Westminster Bridge; men went about selling indifferent liquor, Regatta songs and Regatta cards. The river banks now resembled a great fair, and the Thames itself a floating town. ….I dare say ’tis a good diversion where the weather invites, and the water seduces to such entertainments. Here, however, it was not likely to answer; and I think nobody was pleased. It was beautiful to see the Thames covered with boats, barges, and streamers, and every window and house-top loaded with spectators. I suppose so many will not meet again till the day of judgment, which was not to-day. 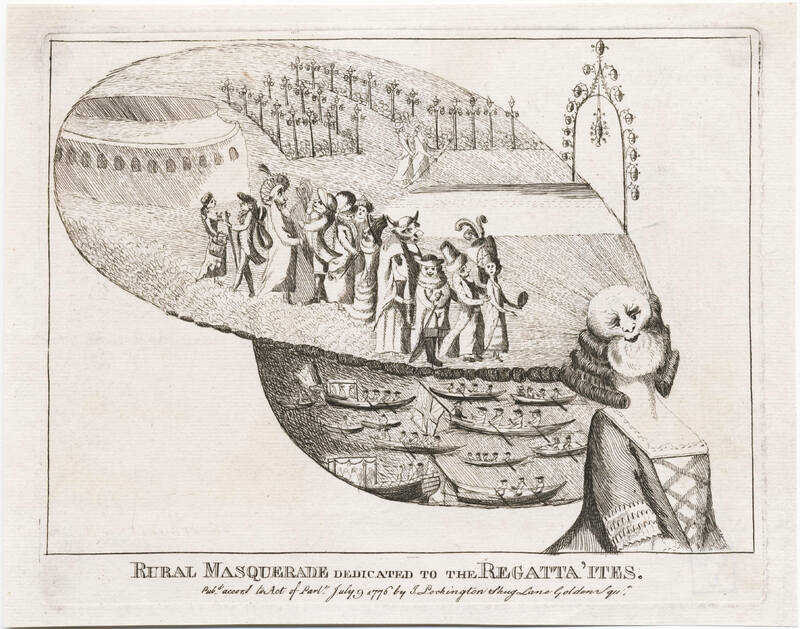 A peculiar and slightly disturbing cartoon of 1776 titled ‘Rural Masquerade Dedicated to the Regatta’ites’. The top part of the headdress shows figures in a garden dressed for a masquerade. Below is probably a scene from the Ranelagh Regatta. 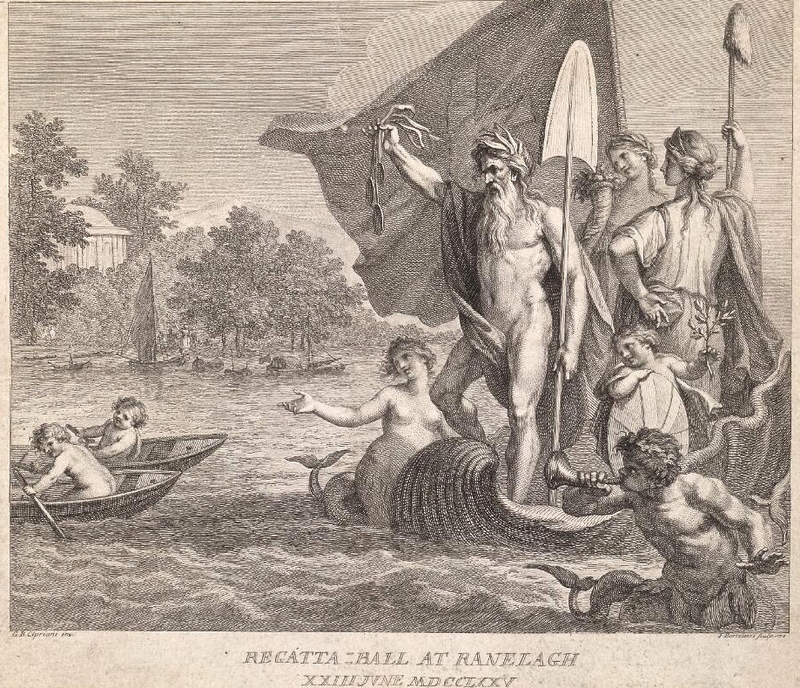 Despite the female body, the figure may be meant to be Neptune or Father Thames. The rowing race involved only watermen and was, as William O’Chee recently wrote on HTBS, ‘between twelve pair-oared boats in three divisions, who raced for a new boat, complete with furnishings and uniforms’. 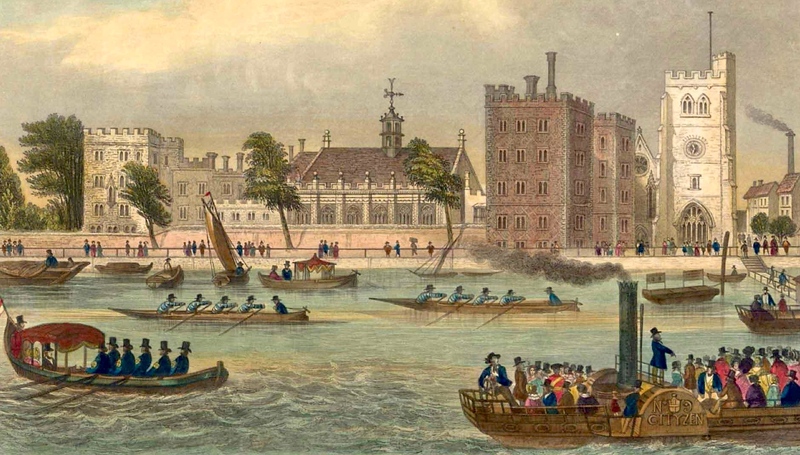 Racing involved only professionals as, while a few eccentric gentlemen at Eton, Oxford and Cambridge may have been rowing for pleasure and perhaps taking part in impromptu contests, for most people in 1775, a boat race with amateur rowers would be as strange as a horse race with amateur jockeys. This George Cruickshank satire dates from over sixty years after the Ranelagh Regatta but I think that it probably captures the spirit of that earlier occasion. 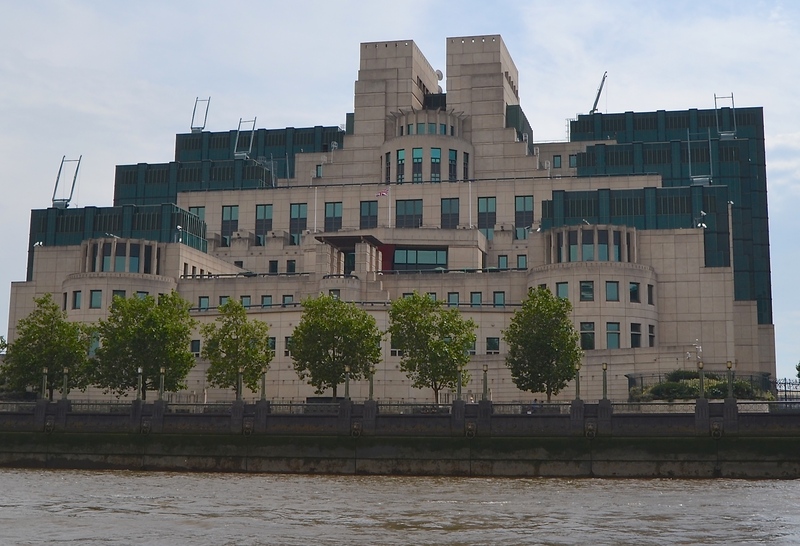 The headquarters of the British Secret Intelligence Service (SIS), popularly called MI6, on the Albert Embankment on the south bank of the Thames beside Vauxhall Bridge. 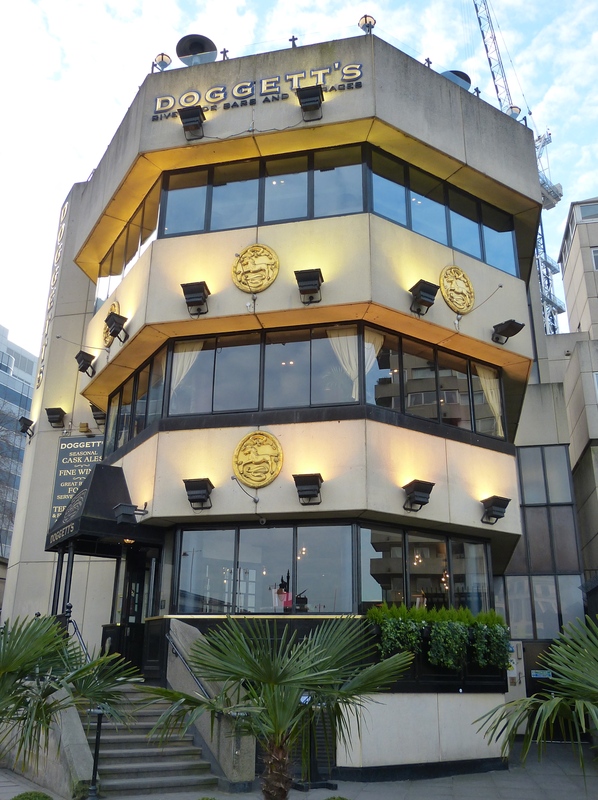 The architecturally challenged SIS HQ is also known as Ceausescu Towers or Babylon-on-Thames. The existence of the SIS was ‘secret’ until 1994, as was the location of its old headquarters in Mayfair, which was only known externally to taxi drivers, bus conductors and tour guides. The Thames-side site once housed Vauxhall Gardens, said by some to be a socially less exclusive version of the pleasure gardens at Ranelagh, and the ‘Vauxhall Grand Regatta’ was run from there for some years. Vauxhall Bridge viewed from the north bank, 1827. 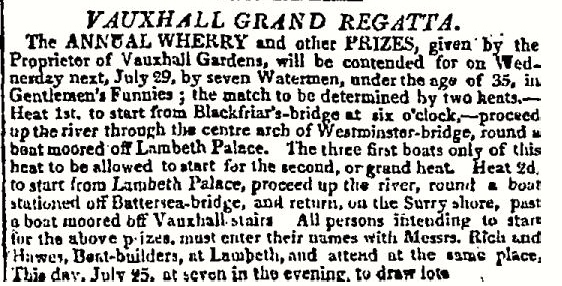 The Times of 29 July 1794 announced: ‘Vauxhall Regatta. 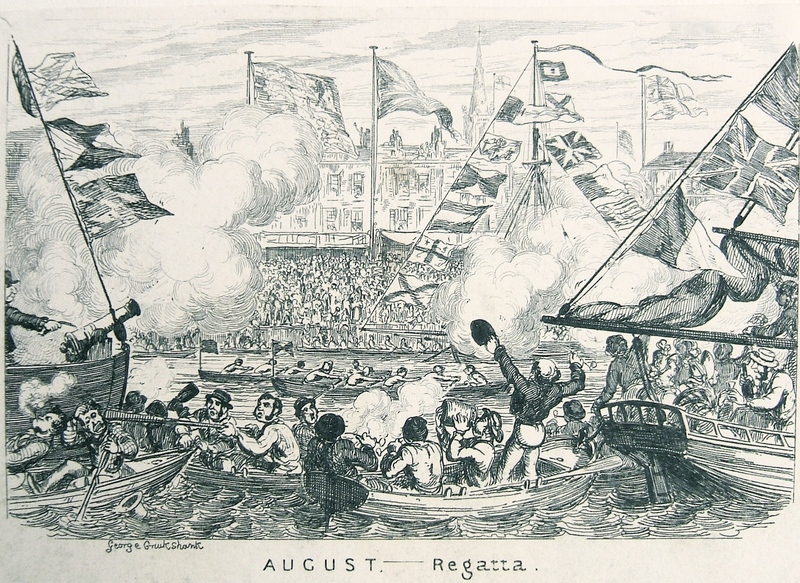 The Annual Wherry, given by the proprietors of Vauxhall Gardens, will be held on Thursday next….. By Seven Pairs of Oars in uniform dress…..’ The Sporting Magazine describes an event on 6 August 1795 as ‘the contest for the annual wherry given by the Proprietors of Vauxhall by six pairs of oars in three heats’. A notice in The Times, 25 July 1812. ‘Gentlemen’s Funnies’ were in-rigged single sculling boats. 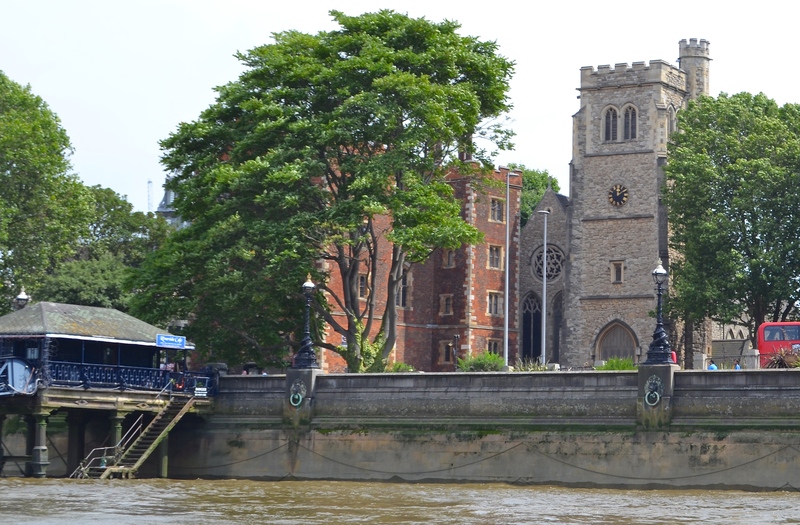 Lambeth Palace, on the south bank of the Thames, about 400 metres upriver from Parliament, has been for 800 years the London residence of the Archbishop of Canterbury. Free from the restraints of the City Fathers on the north side of the river, historically the south bank housed many brothels, taverns, theatres and bear pits – and the home of the principal leader of the Church of England. In this view of Lambeth Palace in 1850, the buildings on the right are still clearly recognisable in the modern photograph. The river, as always in pictures such as the one above, is awash with watermen and lightermen going about their business. Unusually, this one includes two coxed fours racing each other, the crews in uniform clothing. 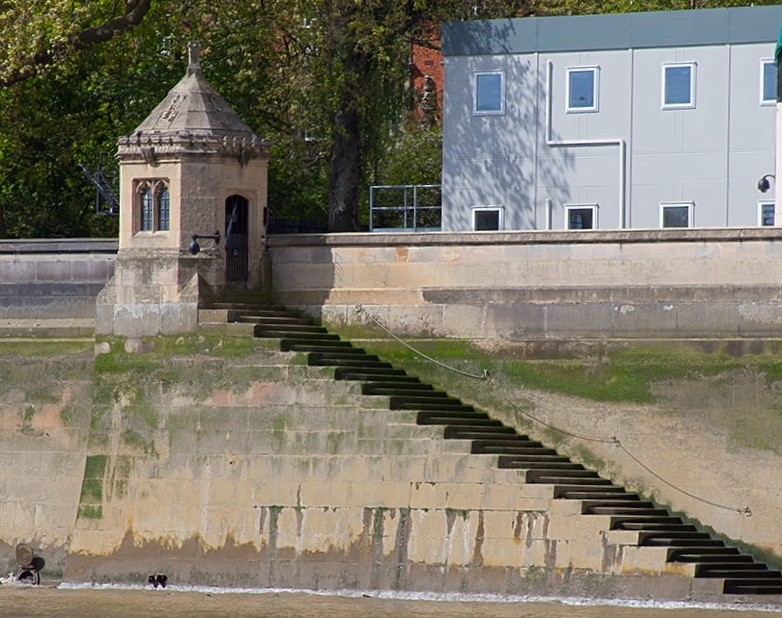 Also, for many years there existed next to the Palace, ‘The Waterman’s House’, part of a charitable trust set up to benefit Lambeth’s Watermen. In the 18th century, the charity was administered from the Archbishop’s Palace and a newspaper of 1768 recorded, ‘Near 300 poor Watermen, Fishermen, &c. in the Parish of Lambeth, were relieved with 5s 3d (27p) each, by his Grace the Archbishop of Canterbury’. My main reason for including Lambeth Palace in a rowing piece is so I can show this cartoon of 1737, titled ‘The Race for Canterbury’. I am indebted to the 2002 edition of the magazine of Oxford’s St Catherine’s College Society for the picture above and an explanation of it. 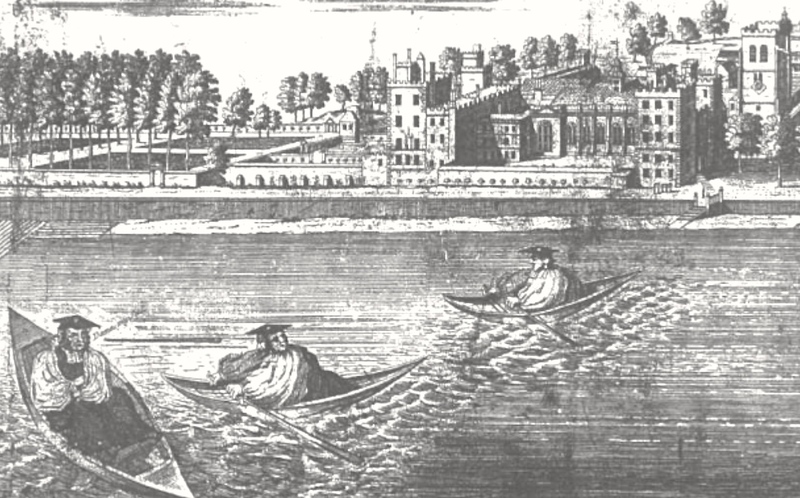 It shows three bishops, Benjamin Hoadly (Bishop of Winchester), Thomas Sherlock (Bishop of Salisbury) and Edmund Gibson (Bishop of London), sculling across the Thames from the House of Lords to Lambeth Palace. They were all rivals for the Archbishopric of Canterbury but the honour eventually went to John Potter, Bishop of Oxford. It is difficult to see in this poor copy, but Potter is already standing on one of the towers of Lambeth Palace. Gibson spots him, casts away his oars and cries, ‘Damn my Scull’. Presumably, this is a near pun on ‘Damn my Soul’. The idea of using a rowing boat or its crew as a political metaphor is a hackneyed one – but is this the first known example? The Palace of Westminster, on the north bank of the Thames, is the meeting place of the House of Commons and the House of Lords, the two houses of the Parliament of the United Kingdom. Our interest is in the river steps and the tiny stone hut next to the trees on the left (in front of the grey temporary offices for those involved in the current restoration work). A close up of ‘Black Rod’s Steps’. The Gentleman Usher of the Black Rod is, in theory, responsible for maintaining the buildings, services, and security of the Palace of Westminster. His steps are a reminder of the time when travelling by river was faster, safer and more comfortable than attempting to use the unsatisfactory roads. 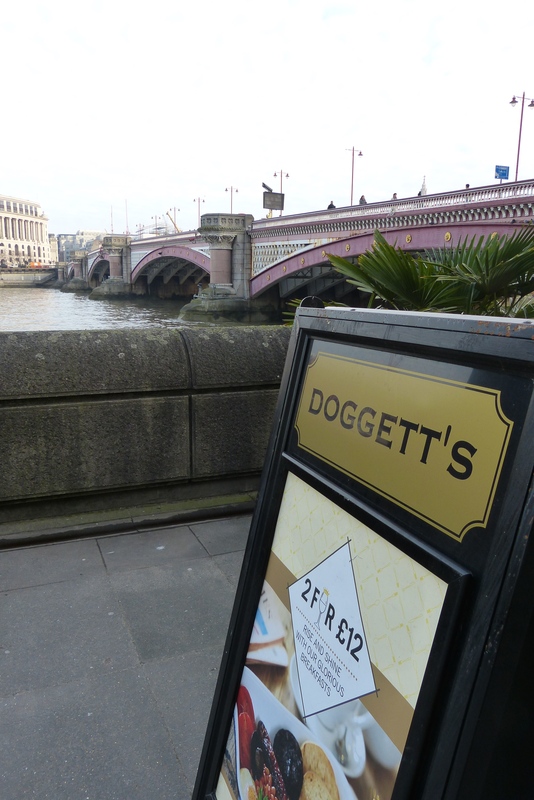 Sited just upstream of Blackfriars Bridge, the Doggett’s pub is better to look out from than to just look at. It is seemingly designed by a graduate of the Joseph Stalin School of Architecture. The sign is the most attractive part. To give due credit, an effort was made with the Doggett’s badges (though they should be in silver). The view of Blackfriars Road Bridge from the Doggett’s pub. 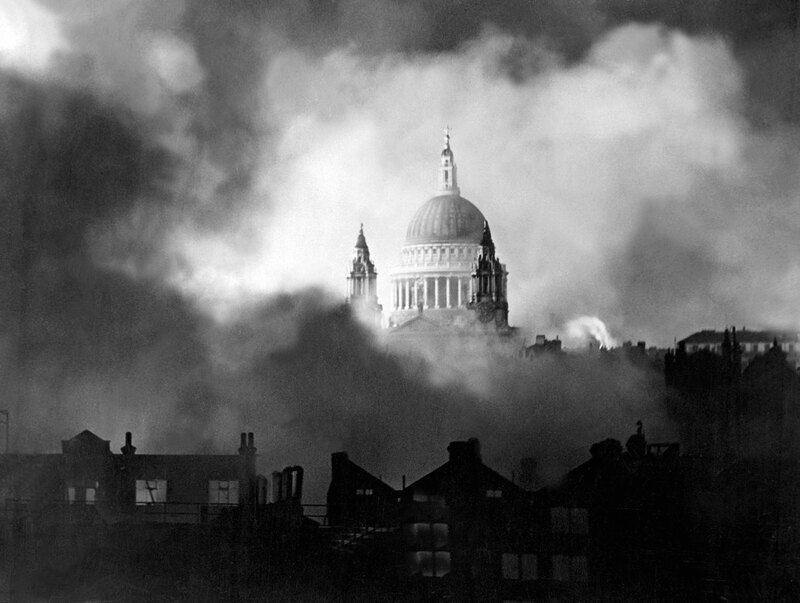 On the left, St Paul’s Cathedral in 2016, the one unchanging part of London’s skyline, despite the best efforts of the Luftwaffe. 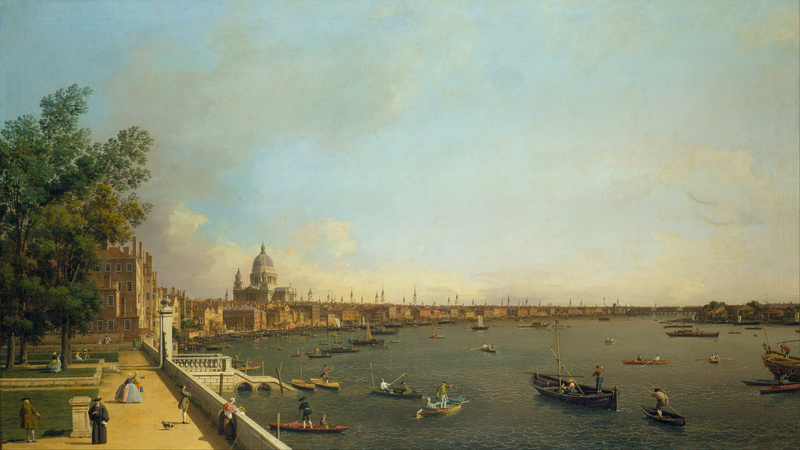 The same view painted by Canaletto in 1750. It may be romanticised but the number of watermen illustrated is probably accurate. 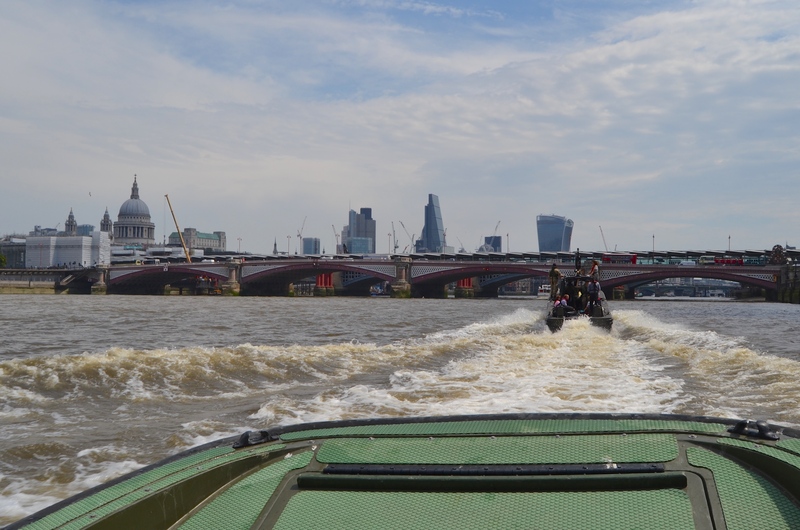 The river journey continues tomorrow with the Boat Builders of Lambeth and with Fishmongers’ Hall. *Douglas Harper’s Etymology Dictionary: regatta. 1650s, name of a boat race among gondoliers held on the Grand Canal in Venice, from Italian (Venetian dialect) regatta, literally “contention for mastery,” from rigattare “to compete, haggle, sell at retail.” [Klein’s sources, however, suggest a source in Italian riga “row, rank,” from a Germanic source and related to English row (v.).] The general meaning of “boat race, yacht race” is usually considered to have begun with a race on the Thames by that name June 23, 1775 (see Oxford English Dictionary), but there is evidence that it was used as early as 1768. Black Rod Steps are also important in the academic/gentleman-amateur tradition of rowing in the UK. Westminster School Boat Club predates the current Palace of Westminster, and its members officially still have the right to pass through the Palace grounds to reach their boats. 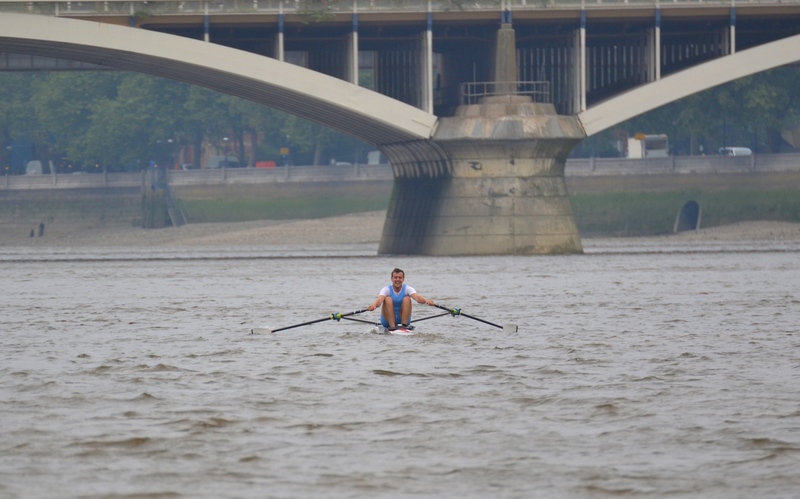 Of course, the club has long since moved to Putney, but the First VIII still row down from Putney to Black Rod Steps each year and land there in order to exercise this right.